Refrigerator water dispenser stops working, dripping or leaking. Refrigerator evaporator fan motor stops running or too noisy. Refrigerator defrost drain is clogged and leaking. Refrigerator drain pan drain is leaking or has a bad odor. Refrigerator freezes food in a Fresh Food Compartment. Refrigerator defrost heater stops working Ice buildup. 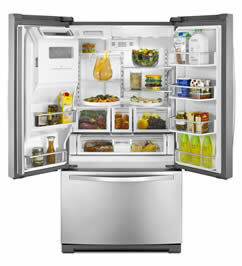 Experts Appliance Repair Ellicott City will diagnose and resolve any of these problems and more. Our technicians are prepared to get to your home quickly and get your refrigerator back in working order to eliminate any further inconvenience and food loss. Don’t just call us when your unit has a problem; be sure to keep up with regular maintenance to extend the life of your appliance!